1) What had the fundamental law of 1906 stated? that Supreme Autocratic power belongs to the Emperor of all Russia, and that no law can come into existence. 2 1) What had the fundamental law of 1906 stated? 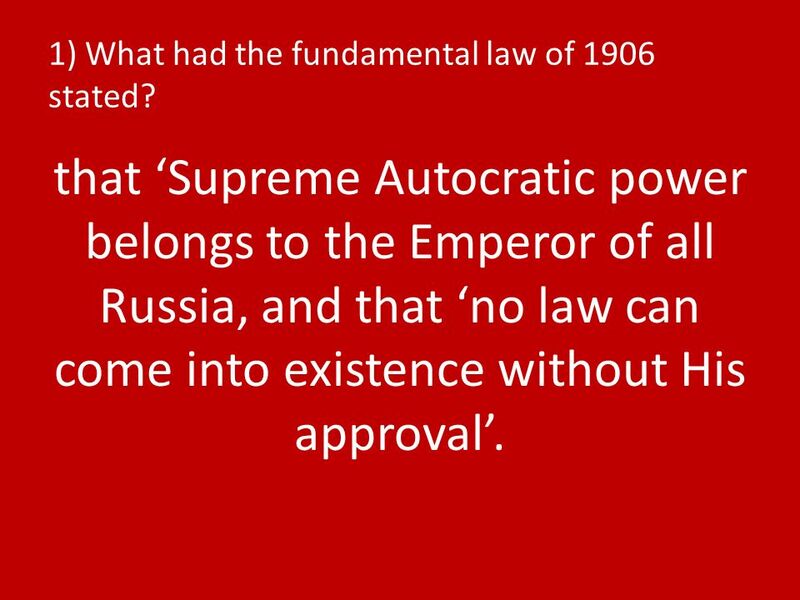 that Supreme Autocratic power belongs to the Emperor of all Russia, and that no law can come into existence without His approval. 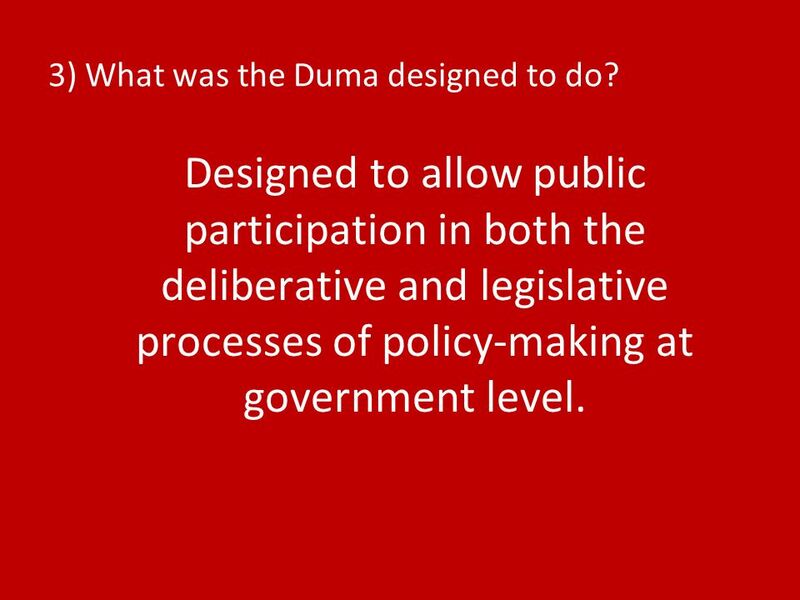 4 3) What was the Duma designed to do? Designed to allow public participation in both the deliberative and legislative processes of policy-making at government level. 6 5) What were his beliefs about the peasants, and what did he plan to do with them? 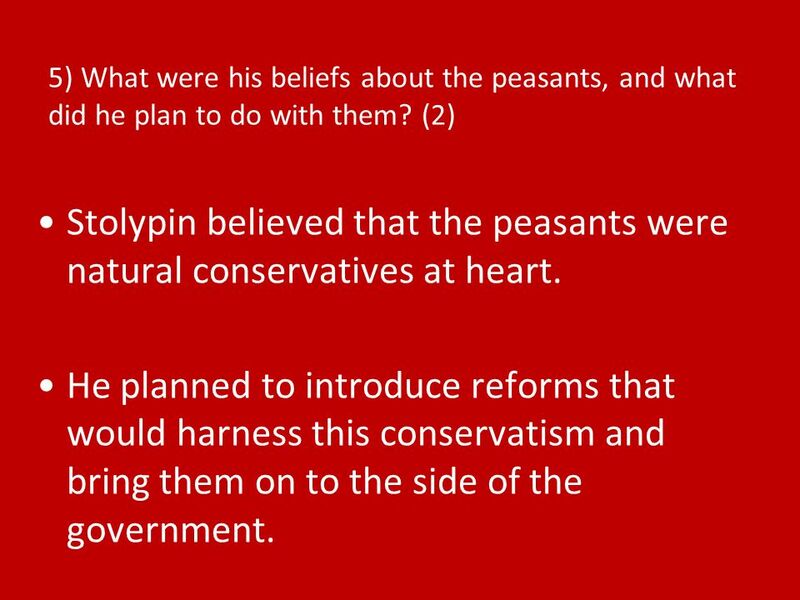 (2) Stolypin believed that the peasants were natural conservatives at heart. He planned to introduce reforms that would harness this conservatism and bring them on to the side of the government. 7 6) What did he do to achieve this? 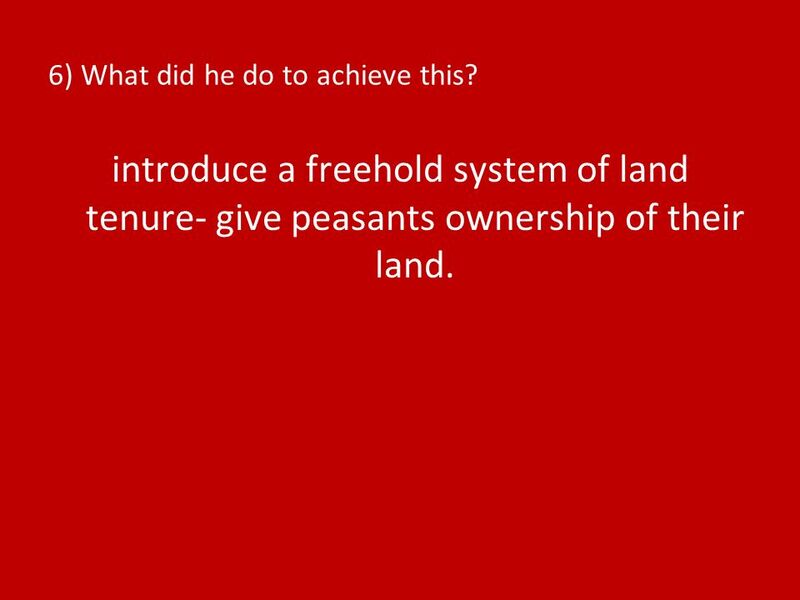 introduce a freehold system of land tenure- give peasants ownership of their land. 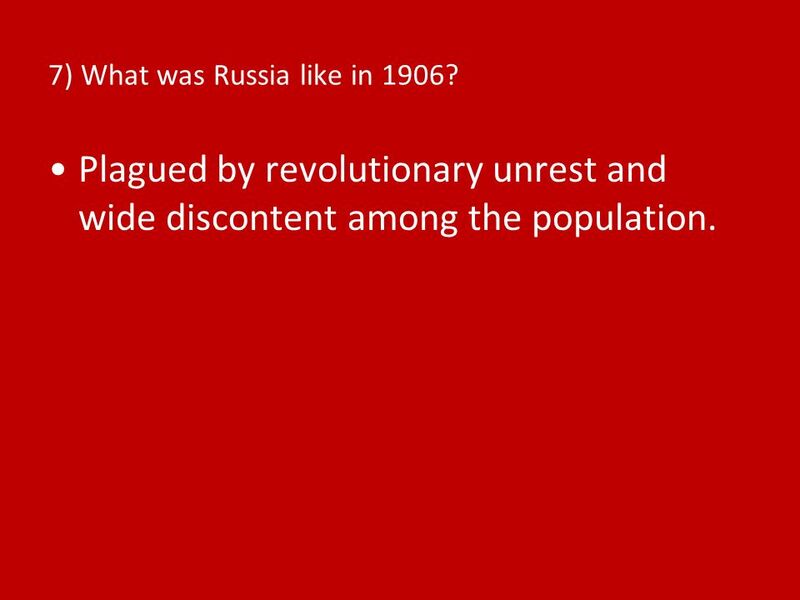 8 7) What was Russia like in 1906? Plagued by revolutionary unrest and wide discontent among the population. 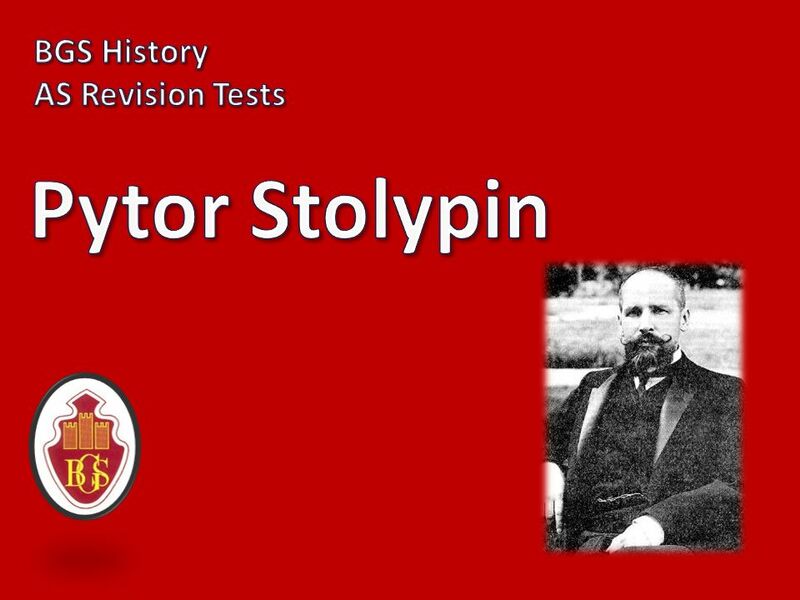 9 8) What did Stolypin do, and how successful was he? (2) introduced a new court system that allowed for the arrest and speedy trial of accused offenders. Over 3,000 suspects were convicted and executed by these special courts between 1906-09. 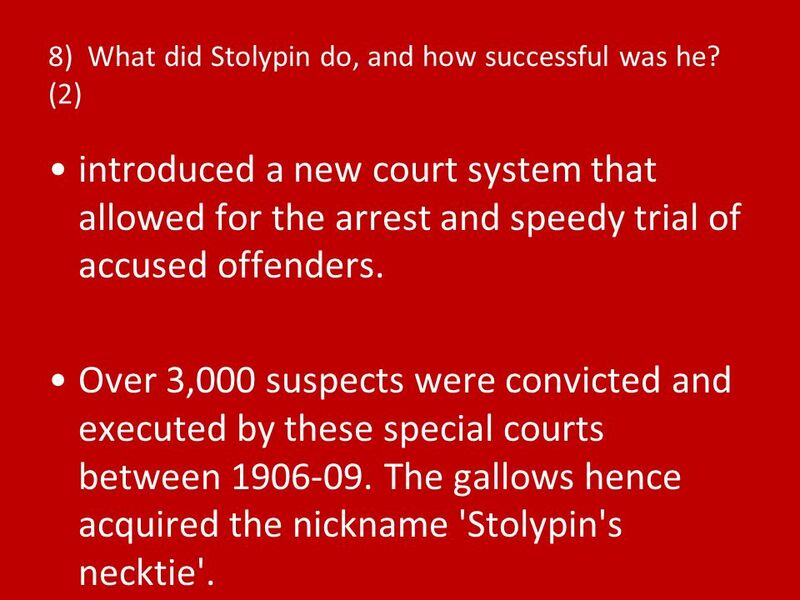 The gallows hence acquired the nickname 'Stolypin's necktie'. 11 10) What did he shout as he died? 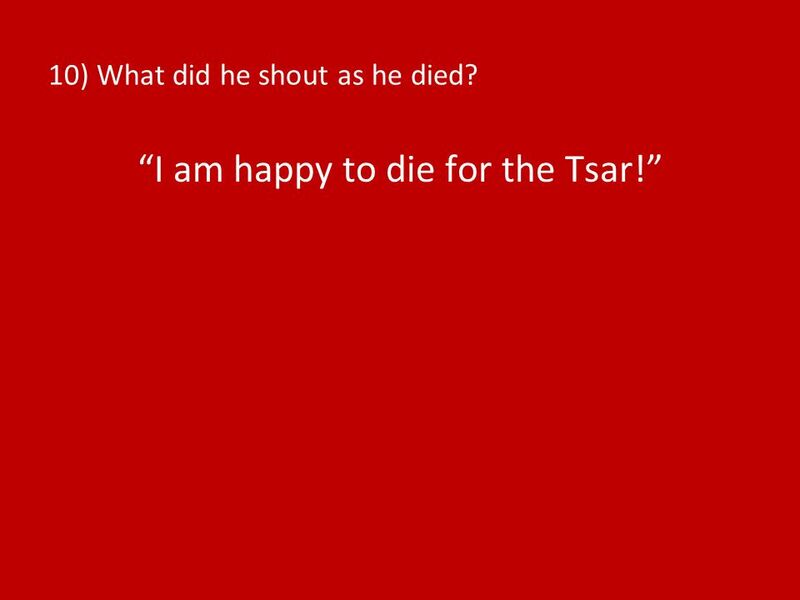 I am happy to die for the Tsar! 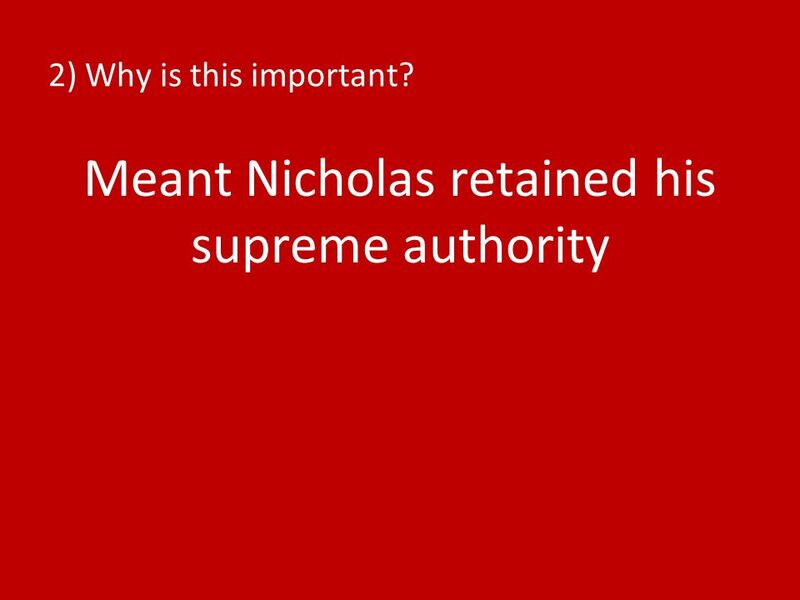 Download ppt "1) What had the fundamental law of 1906 stated? that Supreme Autocratic power belongs to the Emperor of all Russia, and that no law can come into existence." Russia Revision Tuesday 31 May 2011 Topics for Today The Peasants Did their lives remain the same? Were their lives uniformly poor (or bleak) / consistently. Sovereign! We, the workers and the inhabitants of various social strata of the city of St. Petersburg, our wives, children and helpless old peasants, have. The Aftermath of Reform AS Revision. Alexander ’ s Motives Genuine Reformer? Wanted to benefit noble supporters? Moderniser? Autocrat or liberal? Russia in the immediate aftermath of the 1905 Revolution. 3: Saving Tsarism in 4 easy steps! Nick and Pete save the power of the Tsar 1905 was a close one! Counter-Revolution What is a counter-revolution? It’s the action by those in power to counter or crush those attempting a revolution. The Tsar’s counter-revolution. 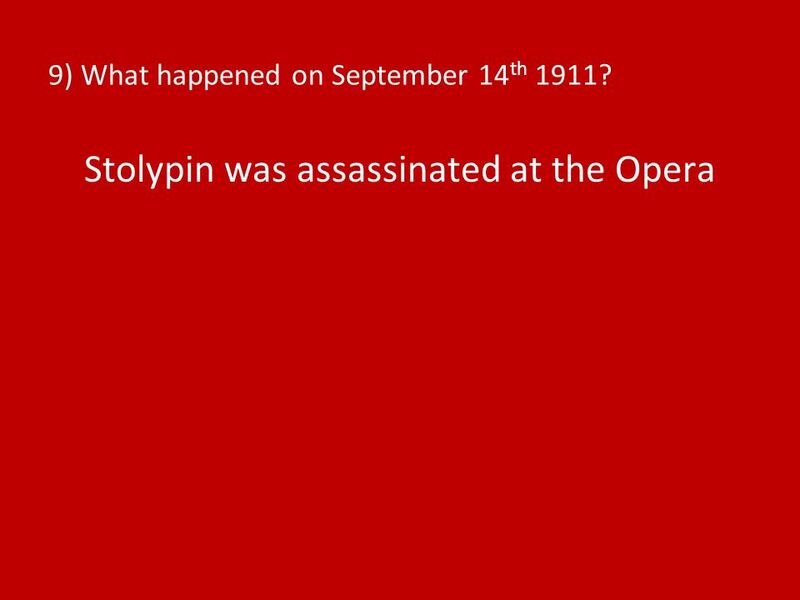  starter activity Peter Stolypin, Russian Prime Minister (replacing Witte) from when he was assassinated at Kirov Opera House. What problems did the leaders of Russia face?. GEOGRAPHY, POLITICS, ECONOMY AND SOCIETY Russia at the start of the twentieth century. Objectives Describe major obstacles to progress in Russia. 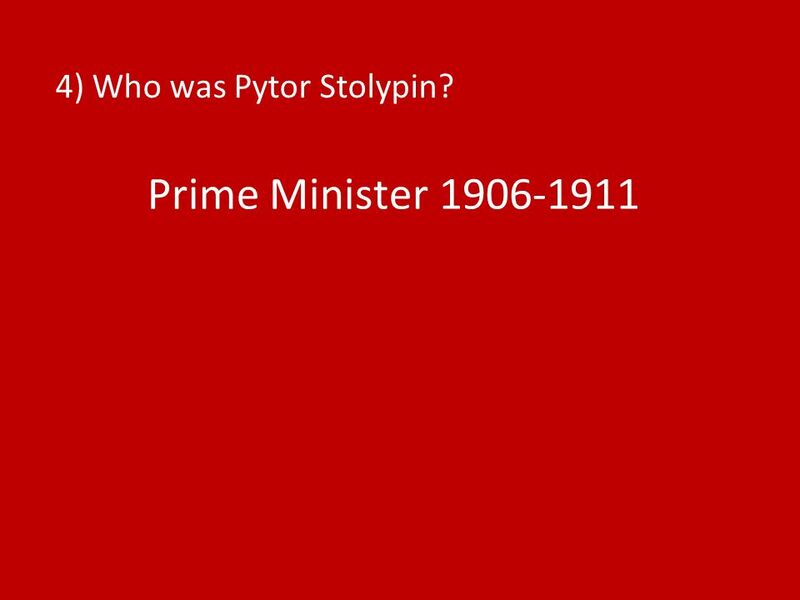 Country Review Jeopardy Template Mr. Oakes Russia Review.